We all know how precious time is and how important it is to use it wisely in our day-to-day. And this is even truer in a mentoring relationship. Because of the limited contact mentor and mentee have, it’s fundamental to make the most out of every interaction. But how can you guarantee that? In the 50s and 60s, a Canadian-born psychiatrist called Eric Berne developed the theory of Transactional Analysis to describe the way people interact and communicate with one another in certain contexts. The theory shows how a person’s up-bringing and internal psychological needs can affect the way they behave with others. This is a very interesting and comprehensive theory, but we’ll focus on a small part of it – how people structure their time and the nature of their interactions, whether constructive or destructive. Mentee: I’m facing a big problem in my shop right now. The shop looks great! I have good products, but I have no customers. I have no idea about how to solve this! Can you help me? Mentor: Of course! Let’s think about some solutions. Why don’t you put a big sign in front of your shop? Mentee: Yes, but my shop looks really good and a sign would ruin that. Mentor: I understand. So why don’t you try to print out some business cards to give to people you know? Mentee: Yes, but I have no money for this. Mentor: Ok. Maybe you could have a discount sale. Like the mentor in this situation, you might be feeling irritated right now. Bang! That’s a psychological game in action! This game is called “Yes, but…”. The name sounds very simplistic, doesn’t it? The reason for that is that Eric Berne wanted his theory to be as simple as possible to allow anyone, even an 8-year old child, to understand it. Now let’s go back to the game. Those who play “Yes, but...” seem to be looking for solutions, but, in the end, they will reject every solution that is offered. In this situation, the mentee puts himself in the position of a ‘victim’ who needs the mentor to act as a ‘rescuer’. The mentee doesn’t feel capable of finding a solution themselves. The mentor thinks they can find a ‘magical’ solution and show the mentee how helpful they can be. Another game that happens very frequently in mentoring relationships is the “If it weren’t for you” game. People who play this game feel incapable/inadequate and do not take responsibility for their development. Therefore, it can be played in a positive or negative scenario. In a positive scenario, the mentee makes the mentor responsible for their successes (“If it weren’t for you, my mentor, I would never have succeeded in business!”). In a negative scenario, the mentee blames the mentor for giving the ‘wrong’ advice, leading them into a difficult position. There are many other games. They always involve two or three characters who take over the roles represented in the diagram below, called the “Drama Triangle” (developed by Stephen Karpman). 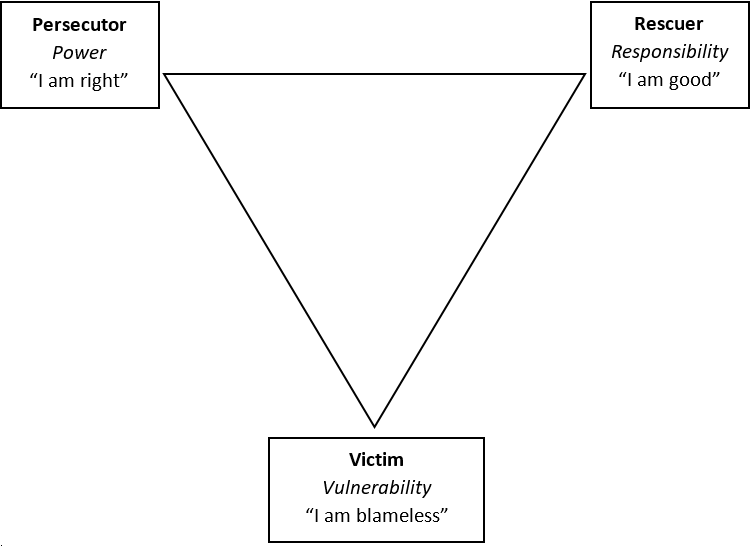 As you can see, the triangle is made up of three characters: the Persecutor, the Rescuer, and the Victim. In a mentoring relationship, for instance, a mentor can be invited to join a psychological game because of something that happened to the mentee, such as a disagreement with a partner, discontentment with their current situation, etc. The mentor might be induced to enter the game in one of the roles above, normally their favourite one (e.g. the Rescuer, who solves the problems of the mentee), or one ascribed to them by the other people involved (e.g. the Persecutor, responsible for the mentee’s problems). The thing is, once the game starts and you accidentally join in, there’s no way out. And you will always end the game in a different position from the one you started in. Most often the Rescuer ends up as the Persecutor. Be honest when communicating with other people. If you have something to say, do it kindly and directly, and incentivise other people (especially your mentee) to do the same. You can find more about the Psychological Games in the book “Games people play” from Eric Berne.